The recent strike by the United Teachers of Los Angeles (UTLA), which ended after negotiations around teacher pay and class sizes, is but the latest in a long list of tensions between traditional public and charter schools. 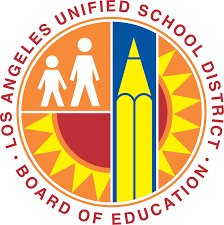 UTLA expressed opposition to the city’s growing charter sector, so the school board has agreed to put forward a non-binding resolution calling on the state of California to cap the growth of charter schools in the district while the state studies policy changes. This strike, in part, highlights the fact that charter schools compete for students and resources, which can cause pain for traditional public schools. While it often seems that charter schools and traditional public schools are adversaries, in many places the two sectors are not as separate as one might think. Nationwide, nearly 90 percent of charter school authorizers (the legal entities that grant charters and oversee charter schools) are actually school districts themselves, according to data requested from the National Association of Charter School Authorizers (NACSA). This means that school districts around the country are often the ones making decisions about when charter schools open and close and what expectations they have to meet. 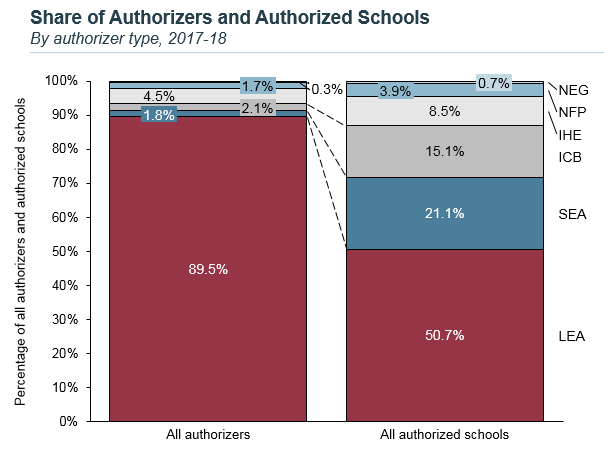 However, NACSA’s data also show that school districts only authorize roughly 51 percent of all charter schools, as they tend to oversee fewer schools than other types of authorizers. As we show in our new publication, “The State of the Charter Sector,” the average school district authorizes only about four schools. Meanwhile, independent chartering boards (statewide bodies set up for the purpose of granting charters and overseeing charter schools) authorize an average of 51 schools, and state education agencies, typically housed in state departments of education, authorize an average of more than 87 schools. This unequal distribution of authorizers and authorized schools is due in part to the fact that independent chartering boards and state education agencies are both statewide entities, overseeing a much larger number of students and schools than a single district. It is also affected by the structure of state charter school laws. While 44 states allow charter schools, only 23 states allow charter applicants to apply directly to non-district authorizers. In the other 21 states, applicants must apply to school districts for authorization of their charter. However, in many states, the denial of a charter school application by a school district may then be appealed to a non-district authorizer. In some places, like in Los Angeles, competition for enrollment and resources is pitting school districts against a growing number of charter schools. But in many more places, charter schools are being overseen by local districts and comprise a much smaller share of overall district enrollment. This means that traditional public and charter schools often need to function as one cohesive sector. In these cases, school districts should ensure they are using strong authorizing practices, such as the list of “essential practices” proposed by NACSA. Our new slide deck, “The State of the Charter Sector,” provides more of the latest available information on charter schools across the country and analyses of the challenges that charter schools face. This entry was posted in Charter Schools, Education Governance, School Choice, State Education Policy and tagged Authorizers, authorizing, charter laws, LAUSD, Los Angeles, Los Angeles Unified School District, National Association of Charter School Authorizers (NACSA), United Teachers of Los Angeles, UTLA on February 21, 2019 by Phillip Burgoyne-Allen.